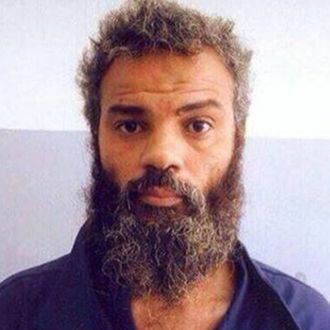 Ahmed Abu Khattala, the designated terrorist who was free to enjoy fruity drinks with reporters until Special Operations forces captured him a couple weeks ago, has pleaded not guilty to masterminding the fatal attack on the American embassy in Benghazi, Libya. The New York Times reports that Abu Khattala arrived in Washington, D.C. this morning, having been transported from a Navy warship via helicopter. He was accompanied by the half dozen or so FBI agents who had been traveling with and questioning him on the ship. The Washington Post reports that Abu Khattala walked into the courtroom, located about a mile from the White House, at 3:30 on Saturday afternoon, unshackled and “wearing a black zip-up hoodie and black pants.” His public defender told U.S. Magistrate Judge John Facciola that her client was not guilty of “conspiracy for mutual support” in the 2012 attack, and Abu Khattala “indicated through an interpreter that he understood the proceedings and would tell the truth.” Federal officials told the Post that Abu Khattala — who the State Department has described as a “senior leader” of the terrorist group Ansar al-Shari’a — will likely be indicted on additional charges. While American intelligence agencies were able to intercept electronic conversations that could help the investigation, their classified nature makes them problematic to use in a public criminal trial, according to the officials. The case is expected to be presented mainly on eyewitness accounts and video from the scene. Hundreds of hours of video from security cameras and other sources were analyzed to produce a narrative of the time leading up to the attacks, the siege of the mission and the C.I.A. annex, and the aftermath, one of the officials said.